If you are registered to vote in one of these states, I would strongly encourage you to vote for these candidates on Tuesday. The Democratic Party is down to two candidates with almost identical policies. This brings the decision of who deserves the Democratic nomination to one of character, reliability, and electability against the Republican nominee in the general election. Barack Obama demonstrates a commanding lead over Hillary Clinton in his consistency on political views, as well as his chances of winning the general election. When Hillary Clinton was voting against a resolution that would require George Bush to be held accountable to the United States Congress and the international community, Barack Obama was stating his staunch opposition to a war in Iraq. Barack Obama is the candidate that stands for reform and transparency in both Congress and the White House. He sponsored legislation that made information on federal spending and campaign donations available to the public. He pledges to make important administration meetings viewable on C-SPAN, as opposed to behind closed doors as the Clintons did with their healthcare policy meetings in 1993. Unlike Hillary Clinton, Barack Obama has a strong opposition to the influence of special interests in Washington. He does not take federal PAC or lobbyist money, and does not have huge corporations backing his campaign, while Clinton owes much of her current power to several large and wealthy corporate donors. Obama not only has what it takes to win in November, but he the candidate who can see beyond his own opinions and motives. His perspective of America is not one of “us-against-them” politics, but one of finding solutions that will respect and serve all Americans, including the ones who do not agree with him. He shows more loyalty to his constituents than his own party’s political establishment. A vote for Obama is a vote for integrity, change, and a belief that our country’s best days are still ahead of us. John McCain is the only major Republican candidate running who recognizes the meaning of true conservatism and how it contrasts with the Republican party’s actions for the last seven years. His campaign promotes an agenda that seeks to restore our country’s tarnished reputation in the world, while not compromising our values or sacrificing our liberties. McCain is a Vietnam veteran who lived for over 5 years in a POW camp. He has the best experience to understand the needs of our military and make foreign policy decisions that keep us both safe and free. Unlike Mitt Romney and Mike Huckabee, John McCain does not seek to build empires and use military action as the first – or only – option, but also knows how to best protect our troops overseas and ensure their success when they must engage in combat. He is the only major Republican candidate that makes a strong stand against torture. He will close the Guantánamo Bay prisons. Like Barack Obama, John McCain is one of the few voices in Washington that speaks out against corporate influence in national politics. He also spends a great amount of effort decrying pork barrel legislation and federal money for special projects. 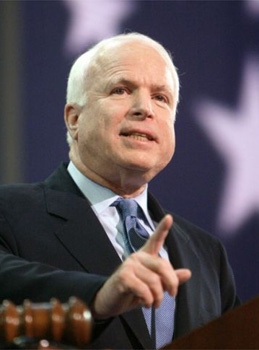 John McCain is the only viable option for an honest and reliable Republican candidate. Both Romney and Huckabee run campaigns reminiscent of the Bush platform – they work hard to sell themselves as “compassionate conservatives” that will treat our citizens with respect and serve us all. But when you examine their track record, it becomes clear that they only work to serve those who conform to their own set of cultural ideals, leaving Americans with different opinions or lifestyles in the dust. John McCain, while firm in his own ideals, conducts his campaign in a matter of decency and respect, regardless of whether or not people support his opinions. On the campaign trail, he encounters opposition and will engage in a respectful and civil discussion of his issue, clearly states his views, allows critique, and does not try to shut off dissident voices. A vote for John McCain is a vote to restore the Republican party to truly conservative principles and to protect civil liberties for Americans and respect the rest of the world. Ron Paul is an even more viable option. He has attacked Mitt Romney many times. If this were true he would be against the Patriot Act and the loss of Habeas Corpus. I might also add that true conservatives call John McCain a maverick. That’s not a good thing coming from your own party. And I’d also like to add that McCain refuses to admit that Iraq was a mistake. He doesn’t have a chance against Obama considering 70 percent of the public are now against the war and Obama offers a withdrawal. I like Ron Paul probably even more than McCain. But he is by no means viable. He has plenty of support online, but his support base failed to do him any good in the actual primaries. I am talking about “major” candidates, as in ones that still have a realistic chance for the Republican nomination. I am wishing Ron Paul the best, and hoping he chooses to run as an independent or Libertarian, because of this. Right now I can only see McCain or Romney – *maybe* Huckabee – in the running for the nomination. Get back to me when Paul gets serious results – not just a couple thousand votes in Nevada and Maine. Until then, I hope he runs as an independent, where he could probably have better chances fighting for votes as a “third option” between both Republicans and Democrats. As far as McCain on Iraq- I completely agree with you. I disagree with his positions on Iraq, which are 100% contradictory from his own views fourteen years ago. McCain has not held a consistent standard on all the issues. However, my perspective is skewed as I will not vote for McCain, but for the eventual Democratic nominee. I simply believe that he is the best major candidate that the Republicans have to offer this year. I believe that Obama and McCain are the best for our entire country – they are the least likely to marginalize the half or so of people who disagree with them. They are honest, and unlike Clinton, Romney, and Huckabee, Americans will know exactly what to expect from their presidency.